The IUPAC International Symposium on Novel Materials and Synthesis (NMS) was initiated in 2007. Since then it has been held jointly with the International Symposium on Fine Chemistry and Functional Polymers (FCFP), which was first held in 1985 in China and has been held almost annually since then. This year, the third NMS symposium (NMS-III) was held on 17–21 October 2007, again at Fudan University in Shanghai, China, and again in conjunction with FCFP (FCFP-XVII). Yuping Wu’s group with Prof. Jean-Marie Lehn (France, Nobel Laureate in Chemistry, 1987), Prof. Chen (China) and Prof. Tang (China). Fudan University, established in 1905, is one of the most famous universities in China. The name “Fudan” comes from the Confucian classics and means “unremitting effort.” The university is situated in Shanghai City, the most dynamic metropolis in China and the home of the upcoming 2010 World Expo. 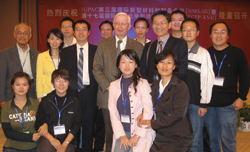 NMS-III was financially sponsored by IUPAC, the National Natural Science Foundation of China, Shanghai Key Laboratory of Molecular Catalysis and Innovative Materials, the Shanghai Society of Chemistry and Chemical Industry, and the National Basic Research Program of China (2007CB209700). Welcoming and opening addresses were delivered by cochairman Yingyan Jiang, head of the Department of Chemistry at Fudan University; Yi Tang, IUPAC representative; and Stanislaw Penczek. More than 200 participants from 34 foreign countries and areas and some local delegates attended the conference. More than 10 foreign participants were from industry, including Sanyo Chemical Industries Ltd., TICONA GmbH, Mitsubishi Chemical Corporation, Givaudan Schweiz AG, DSM Pharma Chemicals, and Givaudan Ltd. The symposium mainly discussed novel polymers with different functions, novel organic chemicals, asymmetric synthesis and other synthesis methods, and novel energy materials, including solar cells, fuel cells, lithium ion batteries, supercapacitors and Ni-MH batteries, nanomaterials, and other novel materials and synthesis related to the environment, medicine, and fragrance. Prominent scientists such as Jean-Marie Lehn (France, Nobel Laureate in Chemistry, 1987), Jean-Pierre Vairon (France), Shinji Takeoka (Japan), Makoto Shimizu (Japan), Masahiro Yamashita (Japan), J.H. Choy (South Korea), Allan S. Hoffman (United States), Stanislaw Penczek (Poland), Dongyuan Zhao (China), Zhengzhong Shao (China), Yunqi Liu (China), and Klaus Kurz (Germany) presented their research. Various companies introduced their latest developments related to novel materials, and an NMS Nobel Laureate Lecture Room was established with the goal of having Nobel Laureates deliver public lectures during the symposium to help laypeople better understand science and technology. The discussion during the symposium was very active, and many participants rated the symposium and its organization highly, particularly for providing a high-level platform for exchanging ideas related to novel materials and synthesis. Of course, fun was also to be had. Yuping Wu’s group from the Laboratory for New Energy and Materials organized a variety of events for the participants, including an acrobat performance, a night boating tour along the Pujiang River, and a tour of Shanghai. The NMS Organizing Committee has decided to hold this symposium biennially in Shanghai; accordingly, the next Shanghai event (NMS-V and FCFP-XIX) will be held 18–22 October 2009. This year’s conference, NMS-IV and FCFP-XVIII will be held at Jiangsu University at the beautiful port city of Zhenjiang, near Nanjing, on 15–18 October 2008. Yuping Wu <wuyp@fudan.edu.cn> is a professor at the Laboratory for New Energy and Materials, Department of Chemistry, Fudan University, Shanghai, China.